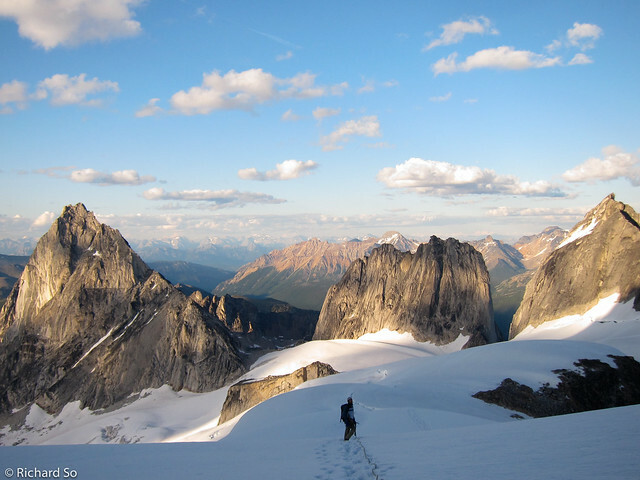 It's been over four years since I've last visited the Bugaboos, an incredible alpine playground that needs little introduction. On that unsuccessful trip, we were only able to climb one route and spent less than thirty hours total in the park, despite carrying in a week's worth of food. The weather deteriorated immediately after Nick and I descended off McTech Arete and with a poor forecast for more snow and rain, we hiked out of Applebee camp by headlamp and in the rain. 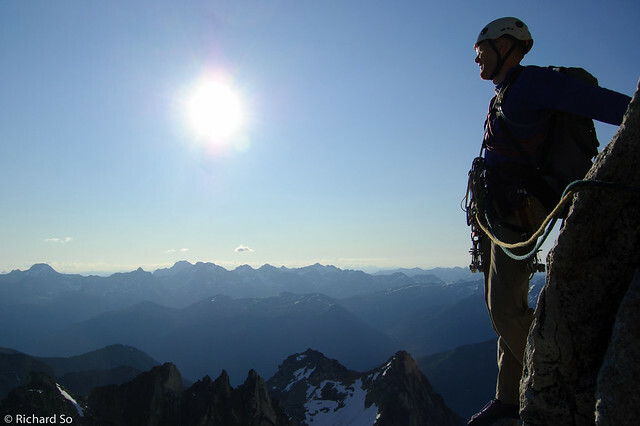 In early August, Chris Barrington-Leigh and I spent seven days climbing in the Bugaboos, enjoying nearly perfect weather, and climbed until our fingertips could take no more. 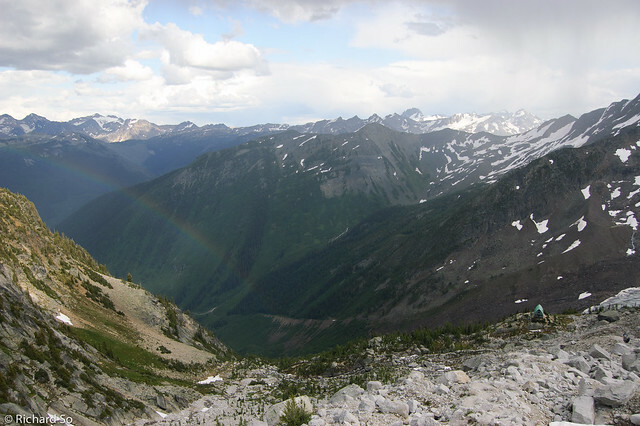 After we climbed Gimli Peak, we drove north to Revelstoke, where we stayed with our friends Natalie and Jeff and took some time to pack my bag with climbing gear, a week's worth of food and an endless amount of gear. The hike into Applebee camp can feel quite strenuous with a fully loaded pack, but at least there's no bushwacking involved. It was fun to think about the last time I was hiking into here. I just remember trying to keep up with Paul and Nick, and not knowing whether I would actually have a climbing partner when I got up to there. We arrived at Applebee early in the afternoon and found ourselves a flat part of this crowded granite dome to set up our tent. Feeling energetic still, we dumped all of our gear out of our packs, quickly pieced together a light climbing rack, and headed off to climb Lion's Way on Crescent Spire, a popular easy climb. A few pitches later and we were on top of one of the Crescent Spires. 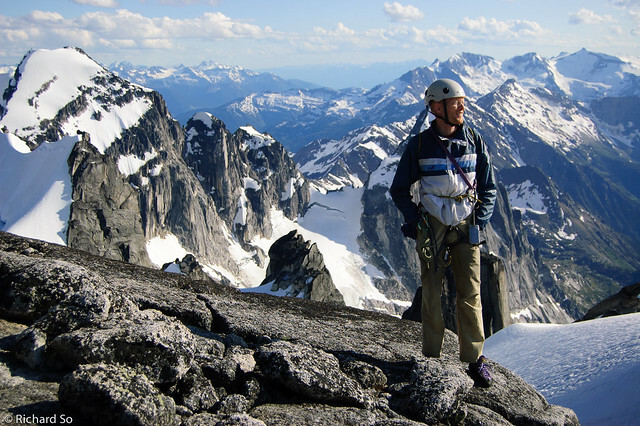 The views of Bugaboo Spire and Snowpatch Spire were just as good as I remember from a few years ago, and Chris was clearly excited that the rock quality in the Bugaboos was living up to his expectations. No grassy cracks here, and minimal kitty litter! Gear explosion at Applebee Camp, with Snowpatch Spire in the background. Our packs contained a week's worth of food, two half ropes, a full climbing rack and more. 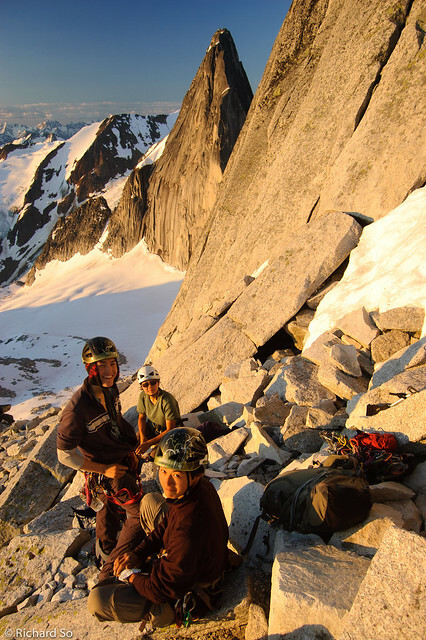 Applebee Camp is quite the social backcountry location, with climbers from all over the world hanging out here. Chris approaching the alpine cragging around Crescent Spire and Crescent Towers, only thirty minutes away from Applebee camp. 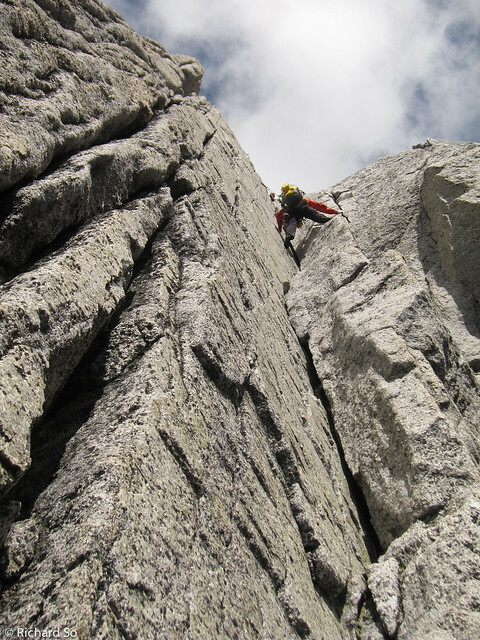 McTech Arete goes up the centre buttress, and Paddle Flake climbs the features to the left. If you look hard, you can make out the little paddle. 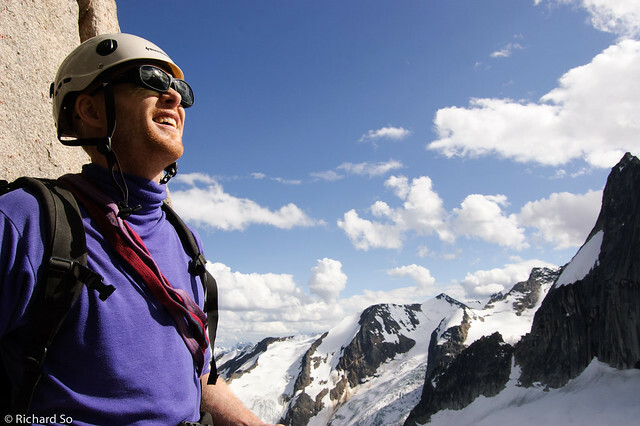 Chris looking excited to be in the Bugaboos. There are some nice looking ski lines in the background. 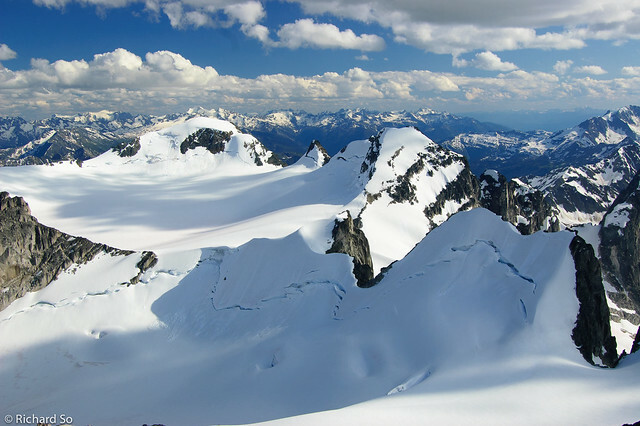 The Bugaboos are famous for heli-skiing in the winter. 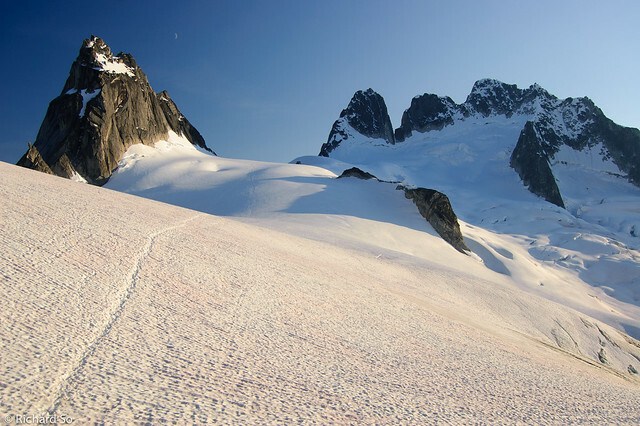 Bugaboos to Roger's Pass ski traverse next spring anybody? There was still a lot of snow in the tarns above Applebee camp. This is in early August. The Bugaboo-Snowpatch col was still in great condition, and I only needed to use my crampons on it once during our early morning ascent of the col on the way to the South Howser. 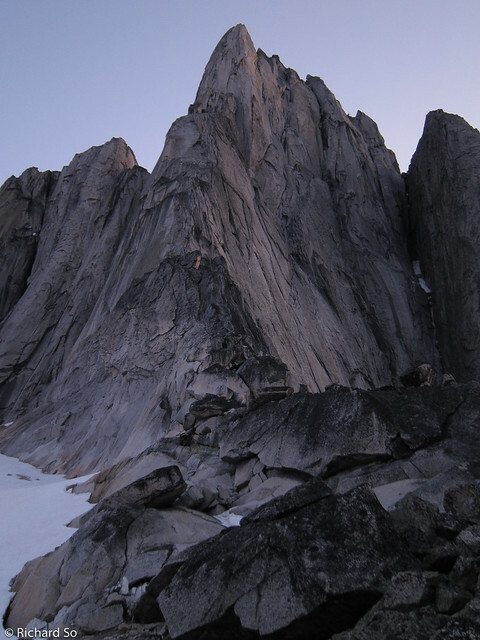 The northeast ridge of Bugaboo Spire, our objective for the next day. 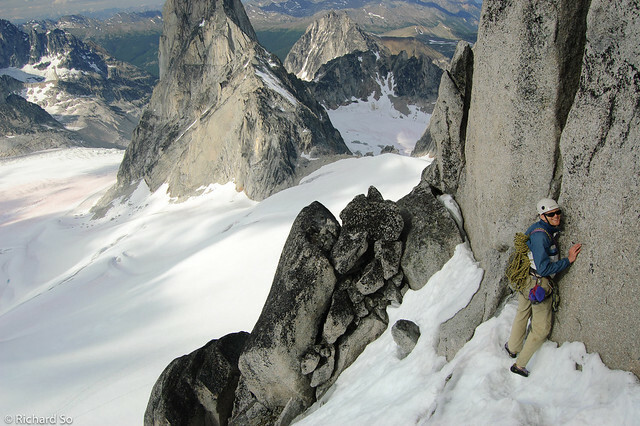 The next day, we woke up at 4am to climb the Northeast ridge of Bugaboo Spire, one of the fifty classic climbs of North America. The route lived up to my expectations, offering great moderate climbing in fantastic positions along the exposed ridge. I was thinking that we could climb something else on the Crescent Spires first before getting onto northeast ridge, but Chris pointed out that the guidebook mentions that over half the parties end up descending in the dark. As such, we went for the safe option and headed up the 4th class scramble to the Crescent-Bugaboo col. A short section of firm snow followed by easy scrambling lead us to the base of the first pitch. We arrived here at sunrise, and the lighting was incredible. 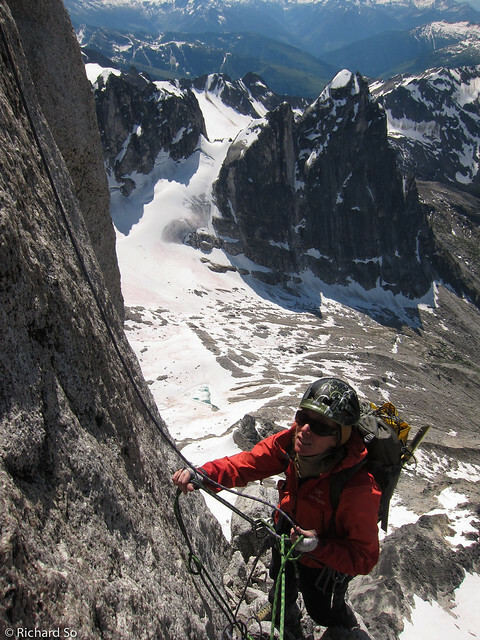 The first couple pitches are the hardest of the route, following cracks and flakes on the left side of the ridge before traversing right into low-angle chimneys on the right side of the ridge. I'm not very good at climbing chimneys, but the low-fifth chockstone filled chimneys on-route were pretty casual. Many parties also choose to simul-climb through the upper half of the route. 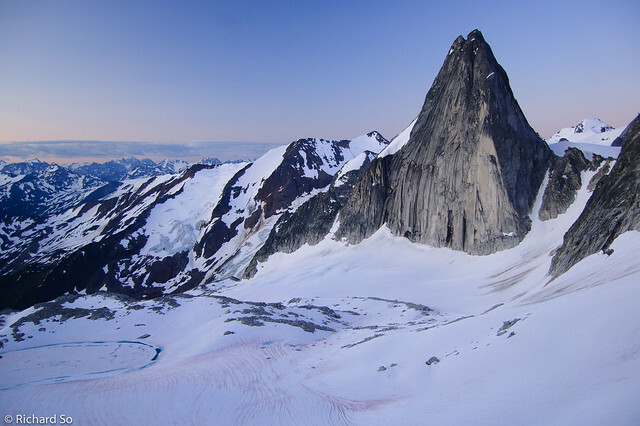 Bugaboo Spire in the early morning. 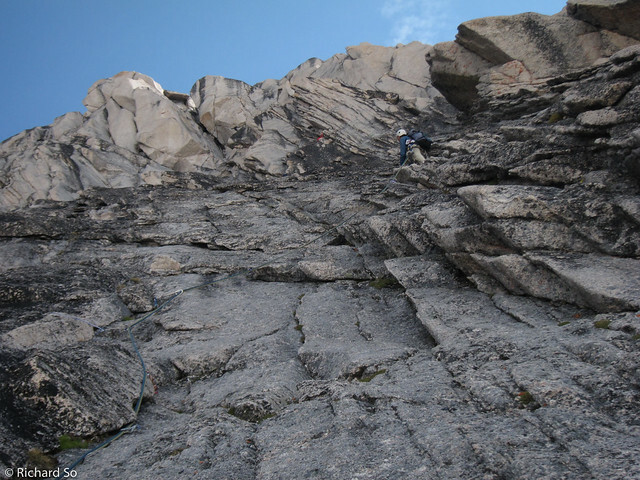 The approach scramble takes a left to right trending ramp, directly above and right of the climbers on the right side of the photo. The standard descent takes the Kain Route, which is the left skyline. Snowpatch Spire in the early morning light. Our Japanese friends, Takuro, Jun, and Masumi, hanging out at the start. They were nice enough to let us pass, although we weren't climbing too much faster than they were. Chris following the finger crack on the first pitch. Chris hanging out on the ridge crest on Bugaboo Spire. We made sure to maximize sunny belay locations. Rockclimbing at 3000m can be chilly! Chris climbing up the last pitch to reach the south summit. Things were going smoothly on the NE ridge, but we slowed down quite a bit once we reached the section where we had to traverse from the north summit to the south summit. 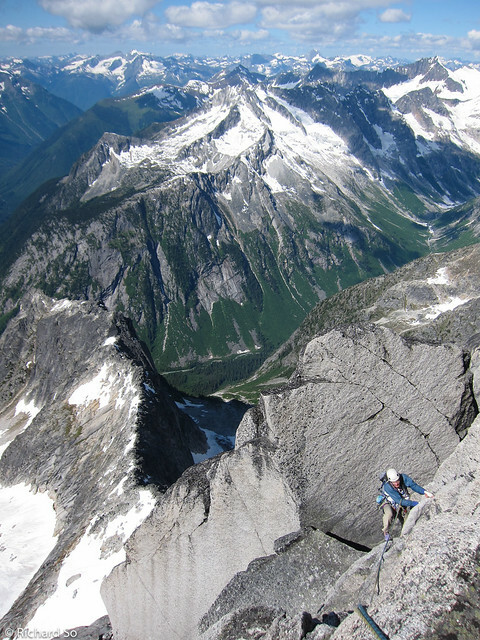 There are a few options to get there, involving rappels and some fantastically exposed ridge scrambling. 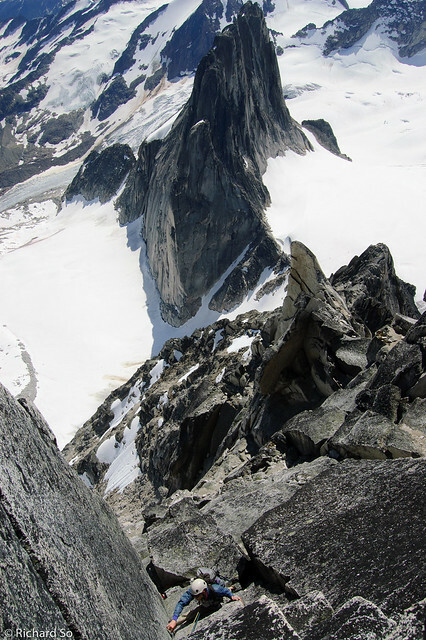 A view of the Howser Towers from the south summit of Bugaboo Spire. We climbed the South Howser tower, the left most peak from the opposite side, and rappelled down the right skyline, and over the bergshrund at the bottom. There is a fully bolted rappel line on it. 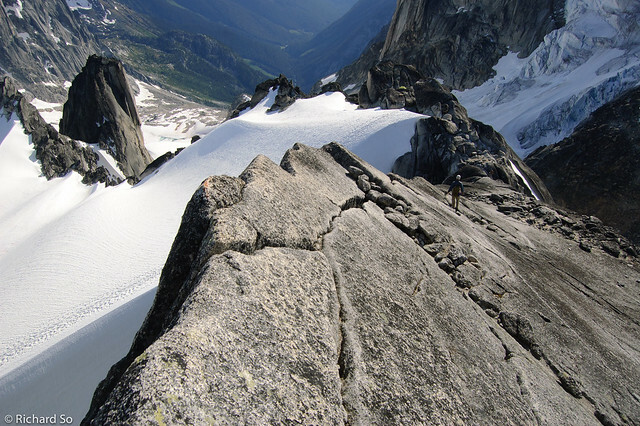 This is the famous gendarme pitch on the the Kain Route on Bugaboo Spire. The rappels off the south summit goes down the blocky terrain on the left side, before heading over to the right side of the gendarme. We got our rope stuck somewhere on the left and I had to lead back up to retrieve it. Our day wasn't quite over yet when we reached the Bugaboo-Snowpatch col. The sun was still shining, and the weather still looked great. 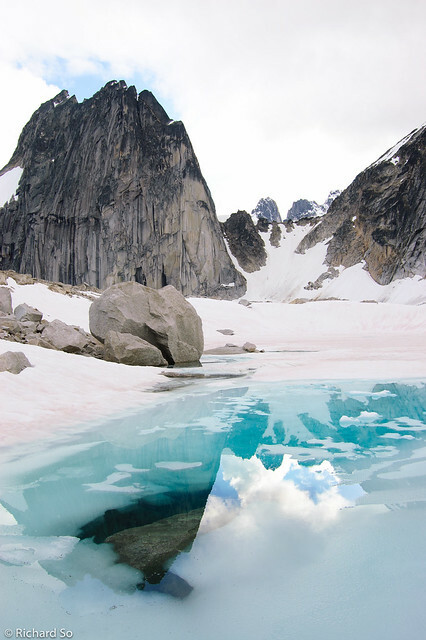 In the Bugaboos, afternoon thunderstorms can be quite problematic, but we were lucky to never experience any of it. 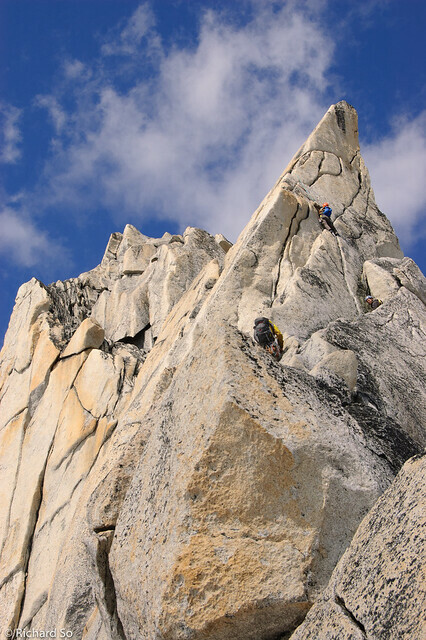 Our next climb of the day was the classic West Ridge of Pigeon Spire. It's probably the best 5.4 in the world. 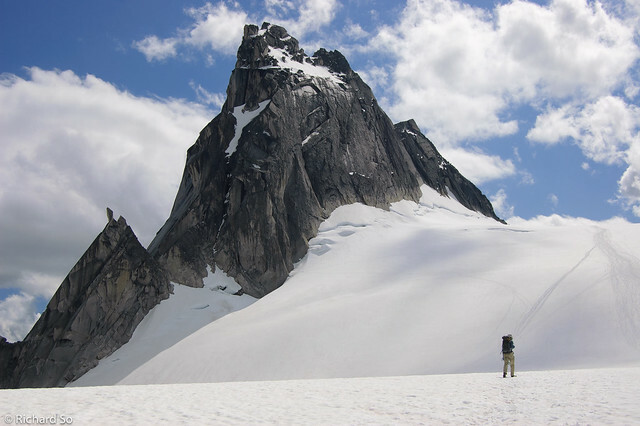 We crossed the glacier over towards Pigeon Spire, enjoying the great views of the snowy Howser Towers. We left most of our gear at the base of the ridge, donned our rock shoes and started scrambling up the perfect granite ridge. Chris was nice enough to carry the rope, as I thought it might be useful for a rappel off the summit. 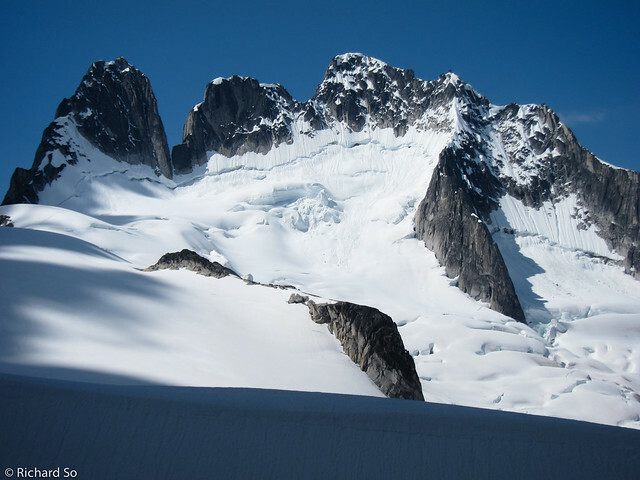 As we passed a pair of descending climbers, they mentioned to us that there was a slightly icy traverse just before the true summit, and suggested that crampons could be useful. We had left the iceaxes and crampons at the base, and figured we might as well keep climbing as it was still quite fun. We reached the bypass ledges on the north side of the true summit, and they were indeed snowy and icy. Chris grabbed a pointy rock and went on ahead, slowly confirming that it wasn't that bad but indeed sketchy. 5.10 rubber works just as well on snow as on rock right? We carefully descended to the Pigeon-Howser col, at which point, Chris started panicking as he no longer knew where his sunglasses were. This meant Chris was lucky enough to climb west ridge again, retracing his steps to the summit and back down slowly, looking in all the cracks. I'm partially to blame his loss, as I mentioned a few times earlier in the trip that his sunglasses didn't look so good in some of the photos. It's especially important in summit photos that all members of the party either wear sunglasses or not, a mix just doesn't work. By this point in the trip, Chris had sub-conciously taken off his sunglasses every time that I pulled out the camera, which was many many times. At one point, Chris commented that this was the most photo-orientated trip that he's ever been on. Unfortunately, Chris never did find his sunglasses, and we suspect that they probably fell off the north side of Pigeon Spire as we were traversing the snow ledges. 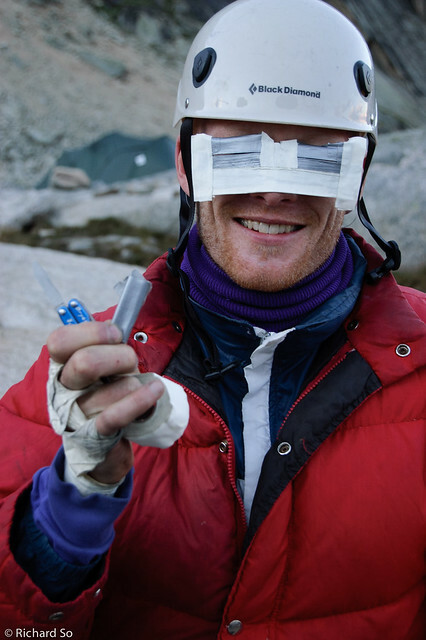 Luckily I had some ducttape, and Chris was able to make a way cooler pair of sunglasses back at camp. You can look forward to them soon at MEC. 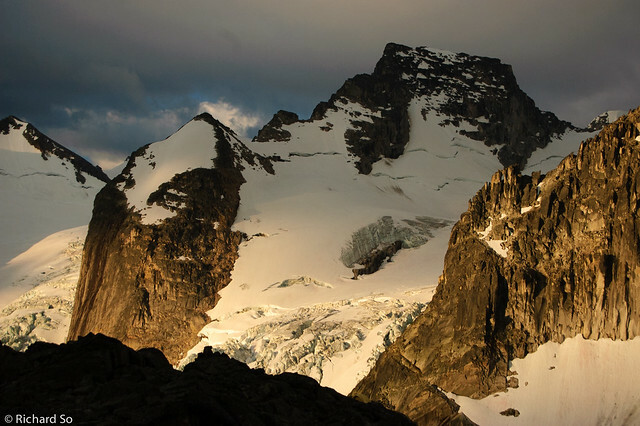 We arrived back at camp late, with grand plans of climbing the Snowpatch route on Snowpatch Spire the next day. Chris heading up the glacier towards the west ridge. The route goes up the right skyline, starting where the rock meets the snow. We traversed the snow on the north side to gain the summit. We didn't rope up for any of the glacier travel on the way to the west ridge, as it seemed like a very well trodden path away from most exposed crevasses. We did rope up later when we hiked back from the base of the South Howser. Chris at the start of the sketchy snow/ice traverse. Roping up would have been a prudent thing to do here. 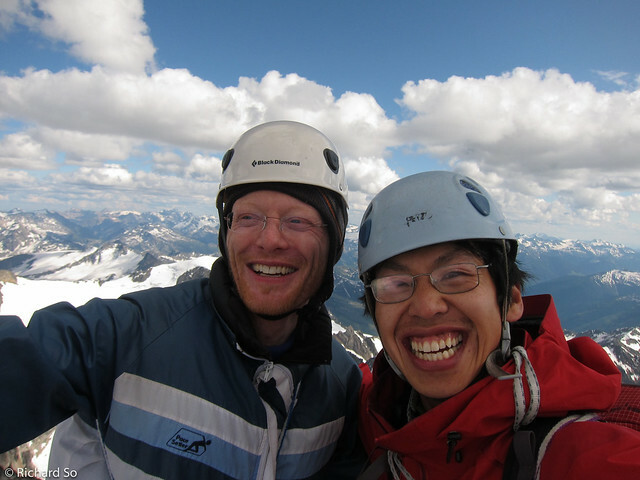 We meet another pair of climbers who were just getting onto the summit. I don't think she appreciated Chris's choice of seating, nor our nonchalent attitude towards the ease of climbing on the route. I found a few pieces of gear, cams and nuts and crampons along the way and it turns out that they had left it along the ridge to make the return trip easier. Chris has a tendency to pose on highly exposed terrain. I think a red jacket might have provided greater contrast to the surrounding landscape in this photo though. Note the lack of sunglasses. I'm not sure if Chris took his sunglasses off for this photo, or whether the sunglasses were already gone by this point. Chris descending the lower section of the west ridge. A few days later we descended the Pigeon-Howser col down into the East Creek basin, the valley at the centre top of the photo. At this point, Chris realized that he lost his sunglasses on-route. 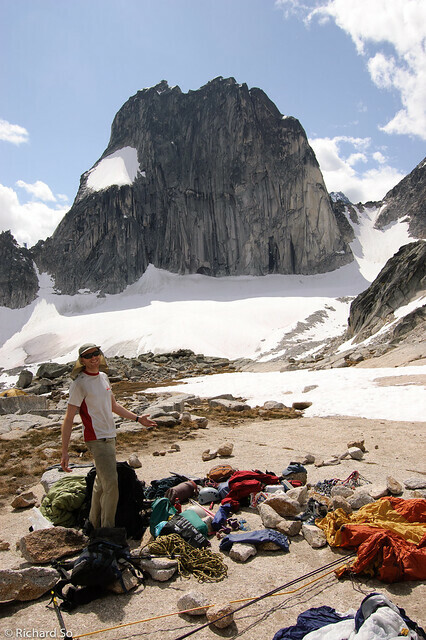 Unfortunately, this was the one piece of equipment that we left behind in the Bugaboos. Fortunately for Chris, we would spend little time in direct mid-day sunshine after this point. So many peaks to explore, if only my map wall extended this far. I don't think I'll ever get tired of this view of Pigeon Spire and the Howser Towers. Unfortunately we had our first and only bit of poor weather early the next morning, just as we were planning to head off to climb the Snowpatch Route. Strong winds and heavy rain was a perfect excuse for us to sleep in. We woke up to glorious sunshine a few hours later, and settled on climbing the Buckingham Route, The Enjoyable Way, a fun 5.8 route on the shorter west side of Snowpatch Spire. 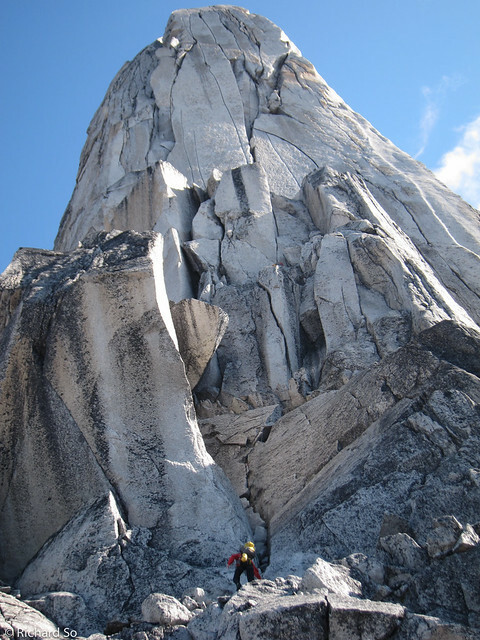 Most of the climbing follows low-angle grooves, until the last pitch which takes an exposed slab with one bolt for protection to a small tower below the summits of Snowpatch Spire. It's possible to continue on to the summit, but a rappel and harder climbing was required, and we were happy to descend back to camp. Sunrise view of the Hound's Tooth and Marmolata. Chris approaching the base of the Buckingham Route. All the routes on the west side of Snowpatch are much shorter than the east side. There was one party ahead of us. It was chilly in the morning until we reached the sun higher up. Another view of the Howser Towers. The other side is even more impressive. 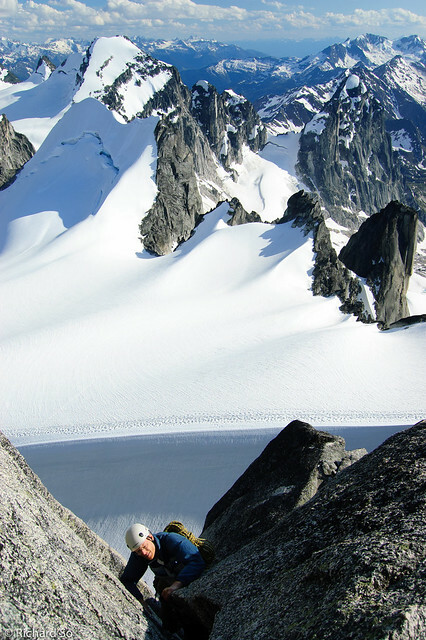 Chris climbing up the slab at the top of the Buckingham Route, with Bugaboo Spire in the background. After two evenings of intense craftsmanship, Chris produced these incredibly stylish pair of lightweight sunglasses. I hope he picks this photo for his McGill website photo. The weather forecast didn't look so great for the following day, so we settled for some high quality alpine cragging on the Crescent Spire. 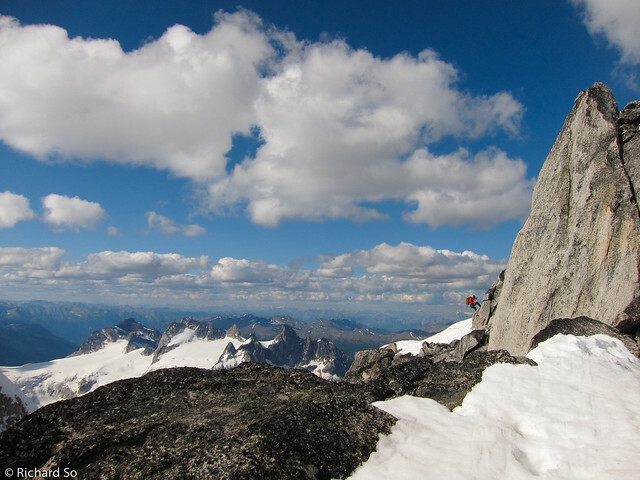 The forecast is generally unreliable in the Bugaboos though, and it turned out to be a sunny day. We started the day with Paddle Flake Direct, a cool looking route which I had seen some climbers on when Nick and I rappeled McTech arete a few years ago. The climbing was excellent and was worthy of it's three star rating. The two noteworthy pitches was the third pitch, a mostly unprotected 5.10 chimney aside from a chockstone halfway up, and then the fourth pitch, a long strenuous pitch of handjamming. 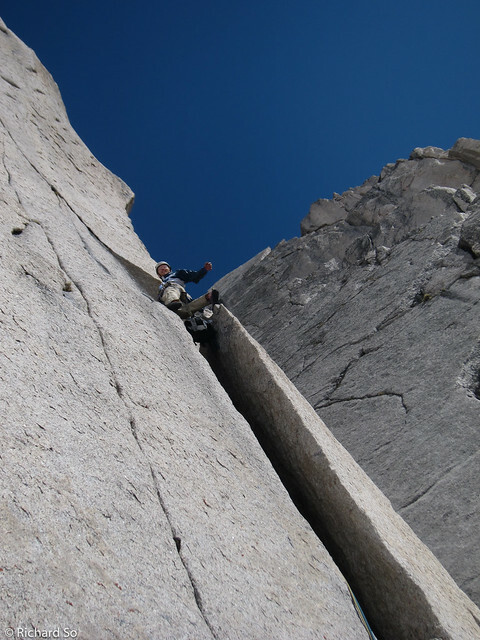 Chris, who's spent many days in Yosemite fine-tuning his offwidth and chimney skills, rope gunned me up this pitch. I think we both lost a little bit of blood somewhere on it. I think there is a variation to the chimney which climbs a handcrack on the right side, but I didn't explore that option. We topped out, enjoyed some food and the views, and rappelled back down to the base. There was nobody at the base of McTech arete, so we figured we should climb that too. 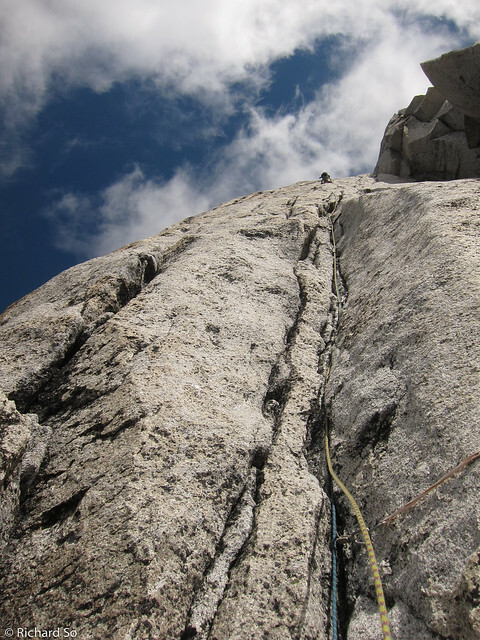 Having climbed it before, I only wanted to lead one pitch, the amazing fourth pitch which follows tight to wide hand cracks for a almost a full rope length, bypassing two roofs along the way. It feels hard for 5.9, but the climbing is great. Things were going smoothly until we got our rope stuck halfway down the rappels. Chris saved the day by leading back up with barely enough rope to free the stuck end. We stumbled back into camp and restored our sugar levels by eating lots of grounded up oreos, part of Chris's high calorie dessert. Chris leading up the first 5.10 pitch on Paddle Flake Direct. The routefinding is not obvious on this pitch, but it goes up to a small belay next to the roof on the shadow line. 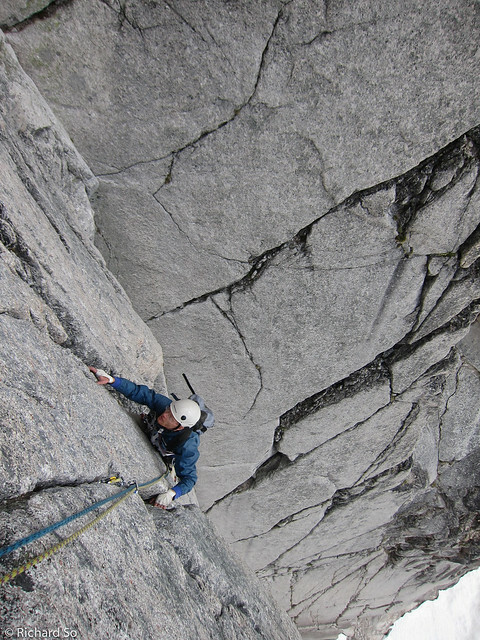 The second pitch climbs the crack above the roof, up the face, and then traverses right to the base of the little paddle. The third pitch is short, and climbs the left side of the little paddle. And the fourth pitch climbs the corner on the right side of the big paddle. Chris was relieved to reach the top of this chimney. Maybe because I was on top rope, but it still felt more secure than the unprotected chimney I had climbed on Fantasies and Fairytales. 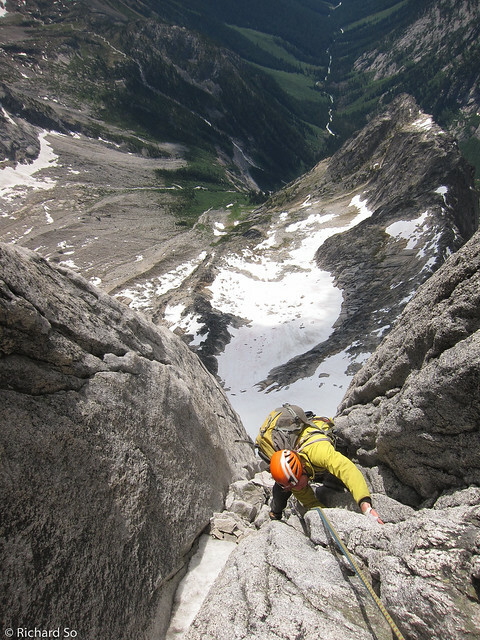 Looking down at the best pitch of the route, a continuous pitch of steep hand jamming with a final steep exit move through a roof. I was worried that I might run out of juice on this pitch, but luckily there were many opportunities to stem and rest. Chris climbing above the roof on the fourth pitch. There is a bolted anchor on the ledge above. Chris starting up the first pitch of McTech Arete. 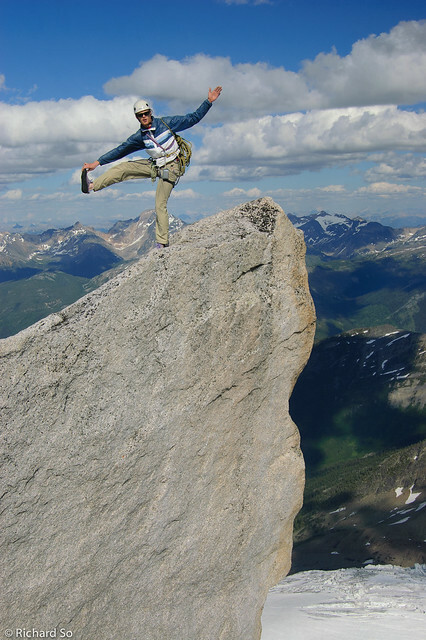 Last time, I climbed the terrain directly above his head. This time, Chris lead up the terrain on the right side, which included one fun move laybacking around a roof. 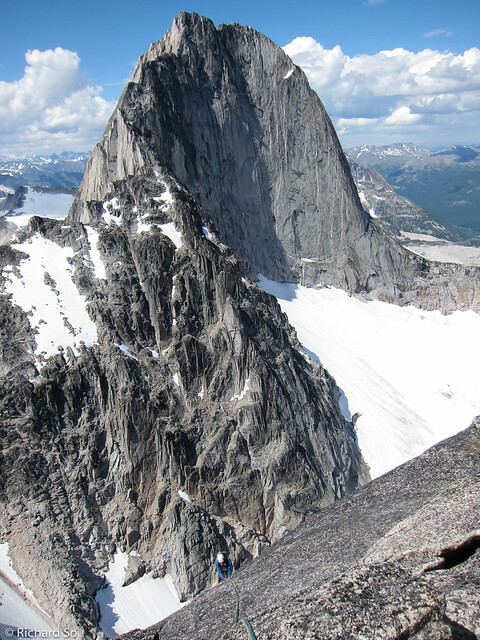 This is probably one of my favourite pitches in the Bugaboos. Last time, Nick got to lead this pitch. We took a rest day after several continuous days of climbing. It was great to be able to sleep through all of the sunshine, and lounge around and eat and do nothing. It reminded me of being unemployed. There is something very special about being in a beautiful area, and just doing absolutely nothing. This is probably what most people do on their vacations at tropical resorts anyways. 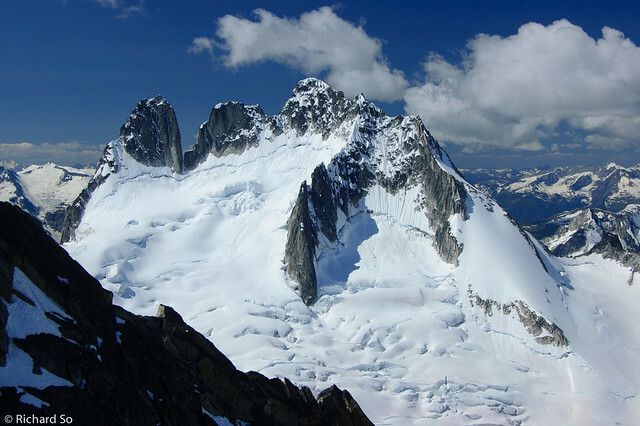 The next day, Chris and I were planning to climb the Beckey-Chouinard route on the South Howser tower. 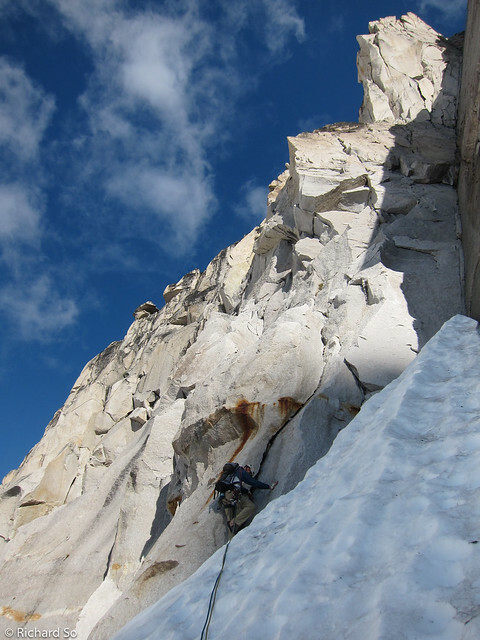 At first, I was hesitant on trying this route, as it sounded like there was still snow on route, and cornices on the summit ridge would make the rappels difficult. After hearing the the route was in good shape, we decided to go for it. Chris sleeping the day away at Applebee Camp. Likely a rare moment of relaxation for his, as he was juggling climbing, car issues, home renovations, a moving to Montreal, a social life and never-ending work deadlines that month. We woke up at 2am the next morning, and set off under the starry skies towards the South Howser Tower. 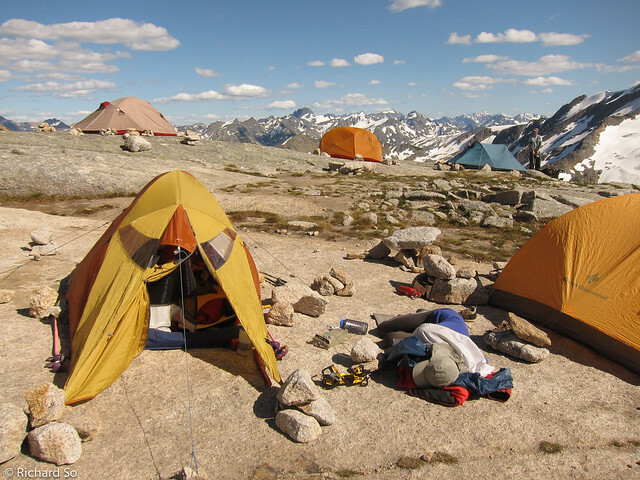 Some parties chose to camp at the Pigeon-Howser col or in East Creek to shorten the approach on the summit day. I am certain that the kneeknacker training paid off for all the long days that we had, more so than the little cragging I did this summer. The scariest part of the day happened as we were climbing up the Bugaboo-Snowpatch col by headlamp. Halfway up, I heard rockfall, and not being able to see further than my headlamp, I nearly spoiled my pants and feared for the worse and listened as numerous rocks or maybe snow came crashing down. Fortunately, there were well to our right, but it's incredibly frightening to hear rockfall at anytime, but especially without being able to see where it's coming from. The previous day while resting at camp, we watched a party of climbers descending the col, with one group at the top and one at the bottom. A few moments later, a large refrigerator sized block came sliding down, cutting across the snow between the two groups of the climbers. In addition, one of the climbers camped next to us also fell down the col and punctured her calf with her crampons. 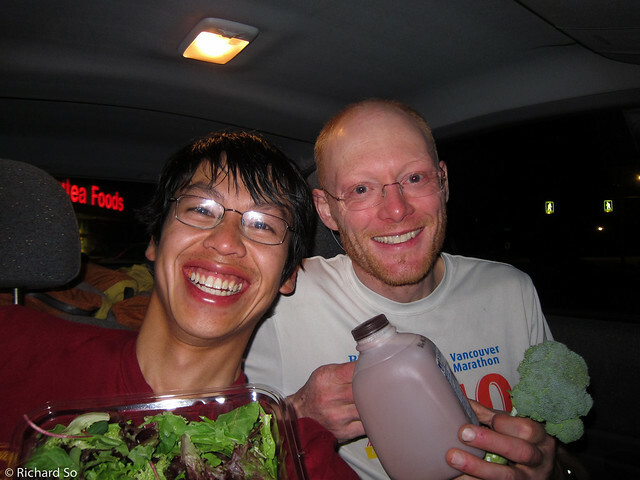 We were surprised to see our three Japanese friends bivied at the Pigeon-Howser col, and they were also planning to climb the route. We left our crampons at the col, and carefully descended the hard snow down into the East Creek basin. This would be a bad place to fall, as self-arresting on the hard snow would be quite difficult, but we managed to get to the bottom. 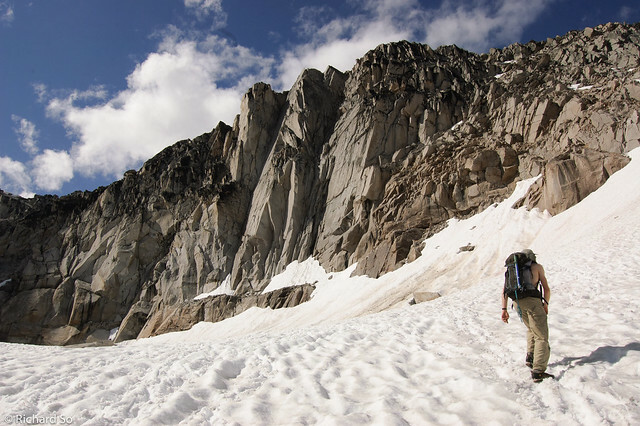 Footwear is also a topic that comes up on any trip in the Bugaboos. Chris had both hiking boots and approach shoes on this trip and strap-on crampons that fit both. I wore lightweight mountaineering boots for this trip. 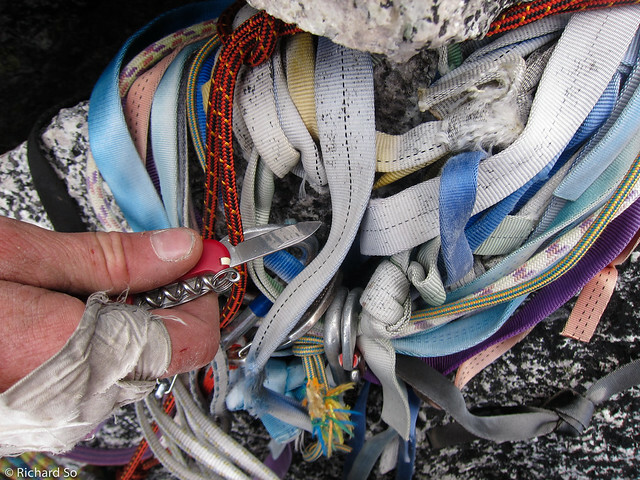 Lightweight aluminum crampons and ice axes are also critical to reducing the pack weight. We scrambled up to the base of the climb, and started to freeze our fingers as we began the climbing. The route is on the west face, and we would not see sunshine until halfway up the climb. I climbed with both my primaloft and goretex jacket until we reached the sunshine higher up. Real alpinists are probably used to this, but I enjoy climbing in sunny places like Spain. 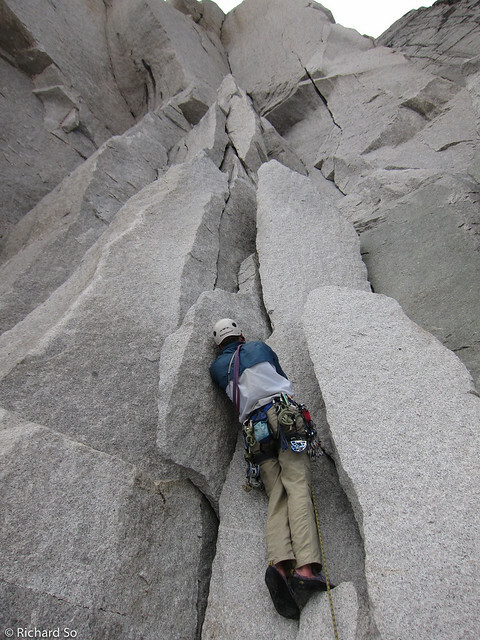 The belays were cold, and the climbing was made more difficult by jamming my frozen fingers into cracks. I have small hands, and I found many of the wider hand cracks strenuous, but the climbing was really good. The route finding is incredibly straightforward, you can just follow the climbers in front. And if you think you're lost, just check with the climbers below you. We met two other new friends Cory and Liz who had bivied on the massive ledge below the Great White headwall. They said it was cold last night, but I bet the sunset was amazing. We reached the summit in the late afternoon, and wasted little time before making many rappels down the South Howser, and over the bergshrund below. We stumbled back into Applebee camp on another late night, and reflect on the fantastic and long day we had just enjoyed on this stellar route. 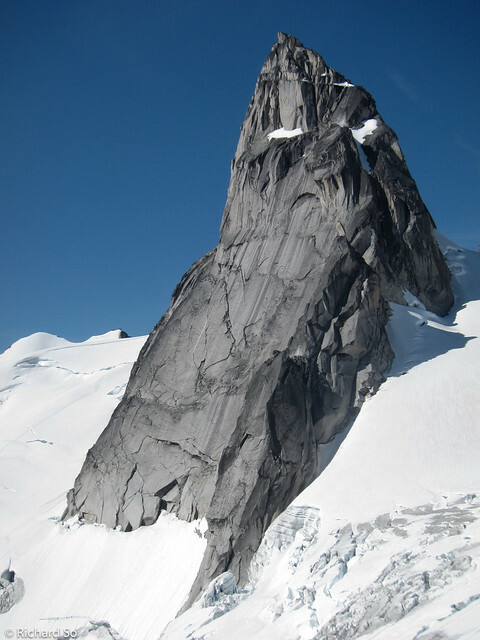 A foreshortened view of the Beckey-Chouinard. Chris leading the low 5.10 pitch. 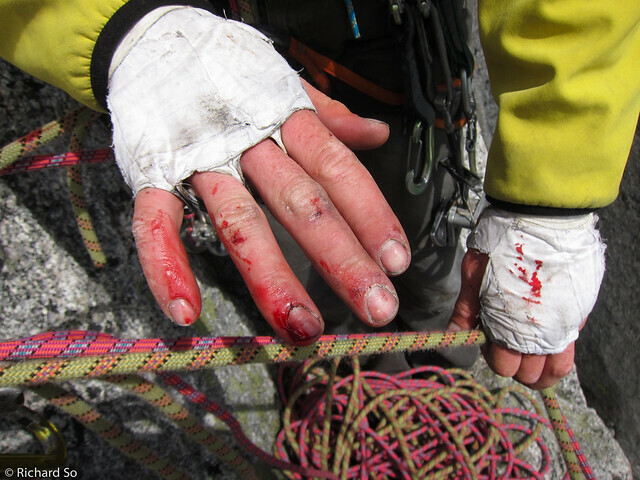 The crux is above Chris, which involve a few insecure moves over a roof and then up finger cracks. Chris styled this pitch, running it out on a marginal gear. Two the best of the pitches on the route goes up the left facing corner above. Perfect hand and fist crack for 300'. Our friends bivied on this gigantic ledge. The route now climbs the blocky terrain, and then the features on the left side of the wall. The splitter cracks on the right side go at 5.11. A view into the East Creek Basin. Completely unlogged and very remote. These peaks reminded me of the Coast. Instead of the climbing the chimney crack on the right side, Chris took the more aesthetic line up the 5.10 finger cracks. The climbing was really good. Another climber, Tim, who was on his way to passing us two short pitches below the top. Naturally I decided to take a photo. Liz climbing the left facing corner. The guidebook describes this as a right facing corner. Don't be confused. Tim and I got into a fist fight at the belay. Actually he had just climbed some hard routes the previous couple of days. My fingers weren't doing much better. 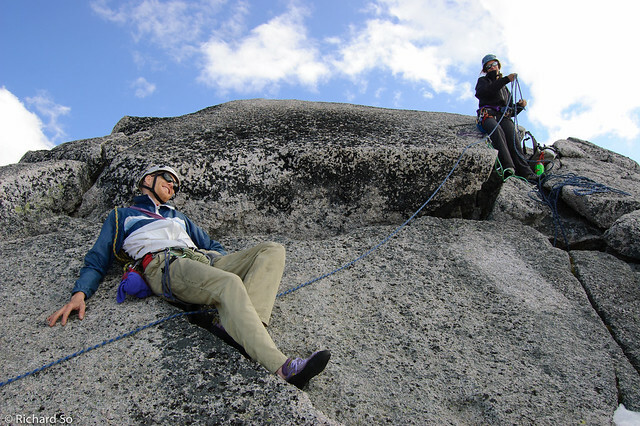 After climbing fifteen pitches, one rappel is required before more easy climbing to reach the summit. There was a ridiculous amount of tat around this chockstone, some of which were merely attached to other slings and not actually around the chockstone. Liz rappelling off the summit. Super stoked to be on the top of the South Howser Tower. The final walk down to Applebee camp. We arrived in camp after eighteen hours on the go. The thing about climbing is that you're really only moving for half the time, the other half of the time is spent faffing, route finding, sorting gear, and belaying. 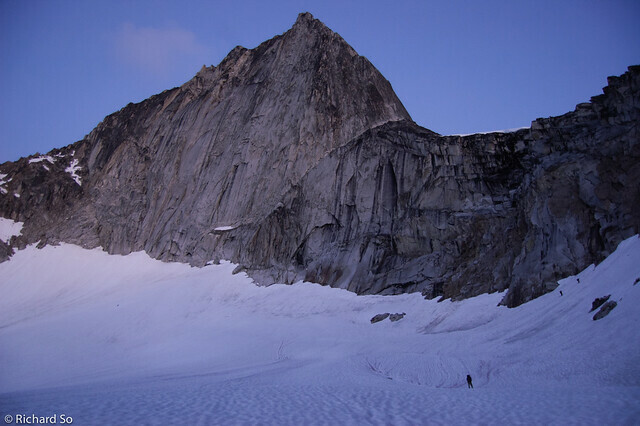 When we arrived at camp after climbing the Beckey-Chouinard, I was in disbelief that Chris wanted to climb another long route the following day. I have no idea where Chris get's his energy from. 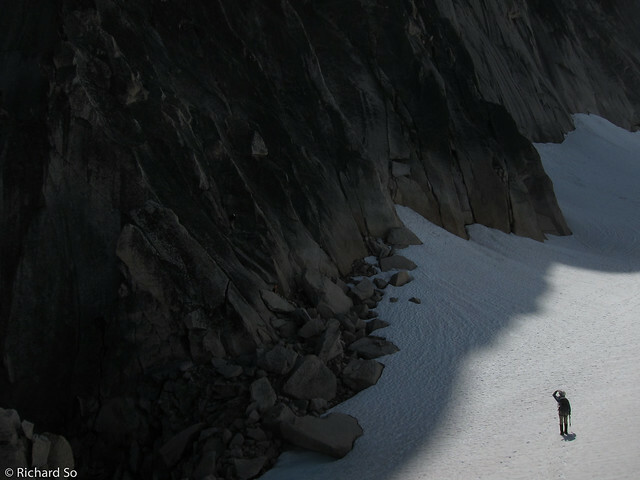 It might be the fact that he's now in Montreal and wanted to get as much climbing done as possible, but the idea of trying the Snowpatch route again came up. But I couldn't fathom the idea of waking up early again, and we settled on sleeping in a bit, and then deciding on what to climb the next morning. It turned out to be a wise idea, as our fingertips were in poor conditions. We settled on Surf's Up, which is suppose to have some great climbing on it. 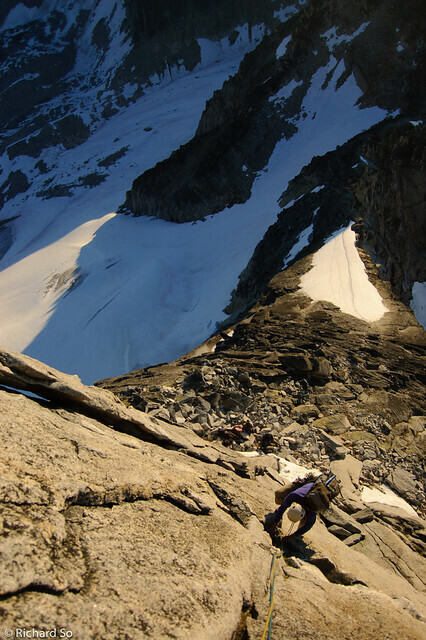 We reached the base of the route, on the west face of Snowpatch Spire, only to see a lost party a few pitches up. They weren't sure if they were on Surf's Up, and we weren't convinced that they weren't. But we racked up and started climbing, thinking that we would figure out where to go. The first pitch was very confusing, and Chris had a hard time figuring out where to go. I took the second pitch and the routefinding wasn't any easier. There was still alot of uncertainty as I lead up through steep flakes and cracks, as the party above us was now clearly off-route. At first there were occasional pebbles came down, but suddenly they knocked off one large rock which flew past our belay. The smell of burnt rock was enough for Chris and I to retreat from the route, fearing any more rocks from those climbers. Two quick rappels took us back down to the ground, where we were able to reflect more carefully on our route. As it turns out, we had scrambled up the first pitch. Chris then lead the second pitch as described in the guidebook, and I was on my way up the third pitch. Oh well. I've now read a few trip reports that described similar uninspiring climbing on the first three pitches, but the upper pitches are reportedly superb and I think I'll have to go back. We retreated back to camp, packed up everything, said goodbye to our new friends, and hiked back down to the car just as a small thunderstorm was rolling through camp. It felt great to walk out of the Bugaboos feeling fully satisfied with everything we had experienced in the past week. Seven days of sunshine on this trip, I don't think the weather in the Bugaboos is that bad after all! 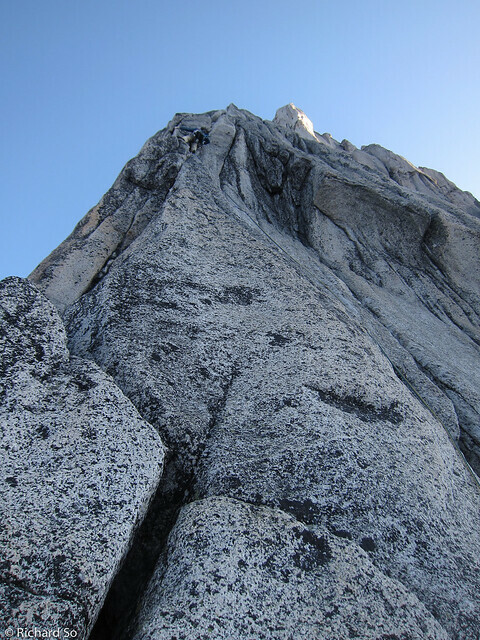 The Cooper-Kor route takes a bold weaving line on the east face of Pigeon Spire. 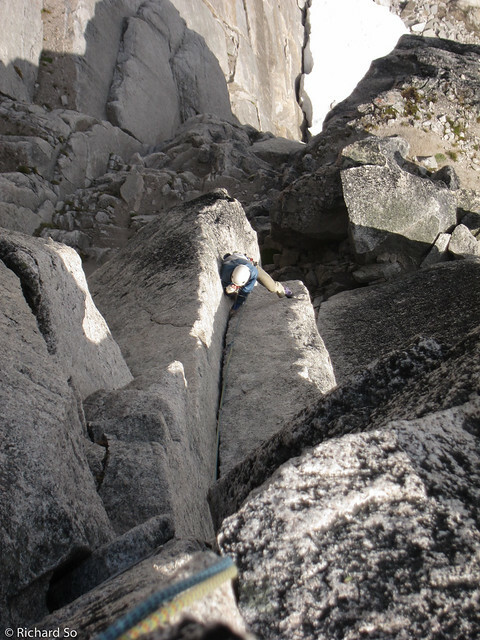 Chris on the uninspiring terrain of mossy flakes on the lower pitches of Surf's Up. 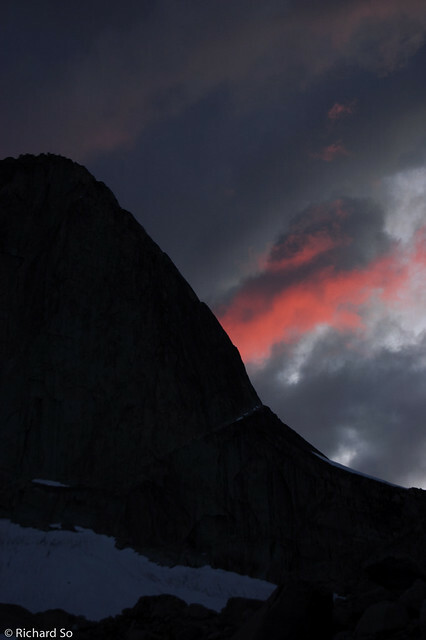 One of the climbers above us is wearing a red jacket. A rainbow came out as we descended back to the cars. Somehow my pack still felt as heavy as it did on the way in. The Kain Hut is nice, but it adds a longer approach to the climb each day. Staying at Applebee Camp is definitely the way to go for most of the climbing. We hiked back down to the car, met our friend Lenka who re-supplied us with chocolate and continued on our way to the grocery store in Golden and marvelled at the endless selection of food. Nice report. Thanks, Rich, for some great climbing!! What a great trip. I can't wait for my next vacation, in 2017! Thanks Chris! I'm looking forward to the 2017 trip! Nice trip report, Rich. I've done almost all the same climbs in the bugs and loved your photos. Question for ya: my partner and I climbed the squeeze chimney pitch on the B.C. 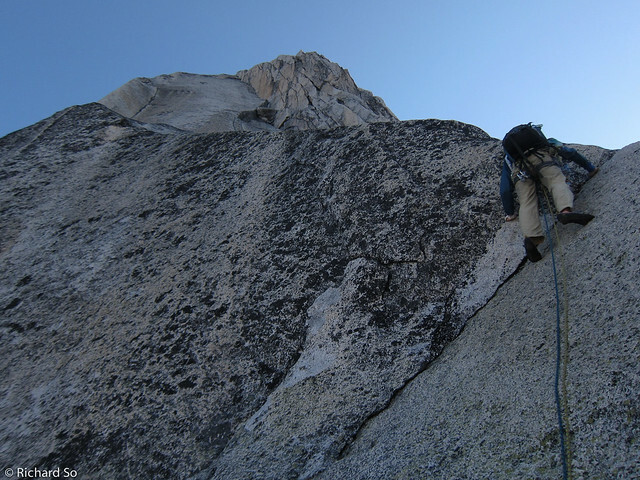 (second pitch off of the great sandy ledge at the white headwall). You folks did the cracks instead, right? These are to the left of the corner that becomes the squeeze chimney - and start pretty much above the belay ledge, I think? What were they like? What pro did they take? About what difficulty level would you right that variation? Yup, we climbed the cracks to the left of the chimney. 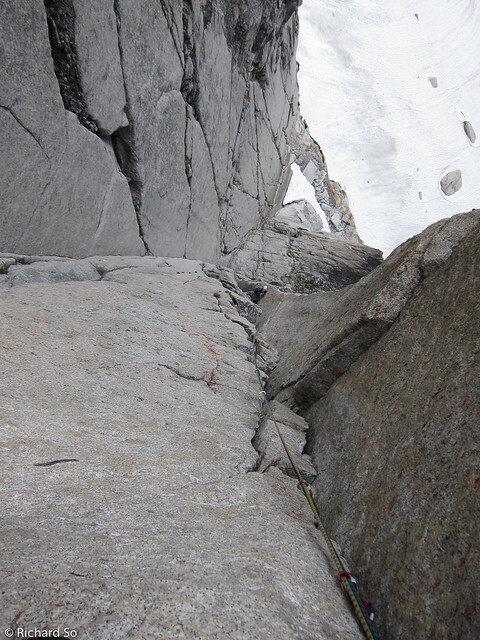 It's indeed the second pitch off the sandy ledge, after the first wide crack. We weren't planning on the cracks, but there was a party already in the chimney and struggling, and the splitter crack on the wall looked more appealing, so we went for that instead. The cracks are really good, fingerlocks the whole way if I remember right. So mostly finger sized gear, long though, maybe about 40-45m? Not sure what the grade is, I'd guess mid 5.10. Somebody else on the internet probably has this written down. Thanks for the info, Rich and congrats on a great blog.